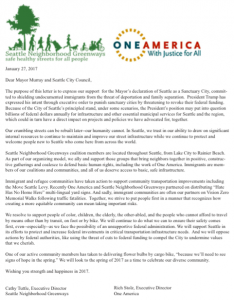 Dedicated leaders in Licton Haller Greenways, Greenwood Phinney Greenways, Ballard Greenways, NW Greenways, Maple Leaf Greenways, and the Aurora Licton Urban Village (ALUV) all had a hand in promoting critical pieces of connected street for people. People who’ve lived in Seattle for a while know how difficult it is to travel east to west. 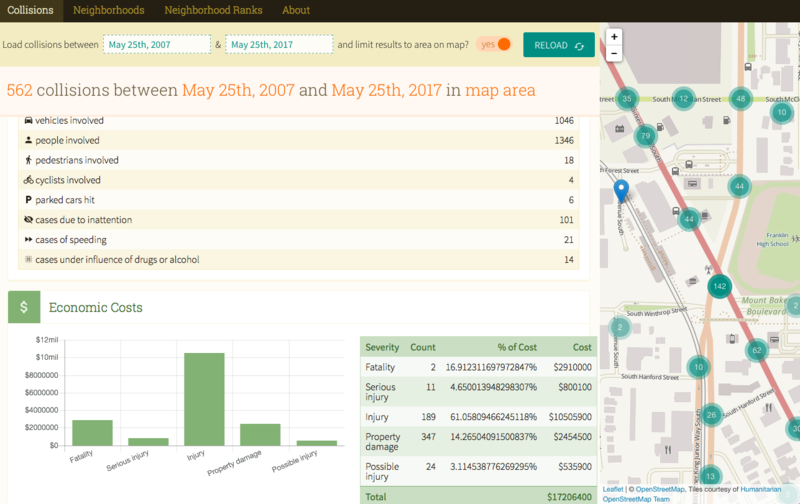 Maybe it is because of the steep hills that define our neighborhoods. 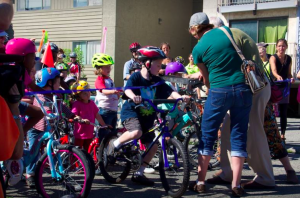 Because of the work of multiple local groups, there is a new way for people who walk and bike to go from east to west on NW/N/NE 92nd (the street changes its prefix as it travels). 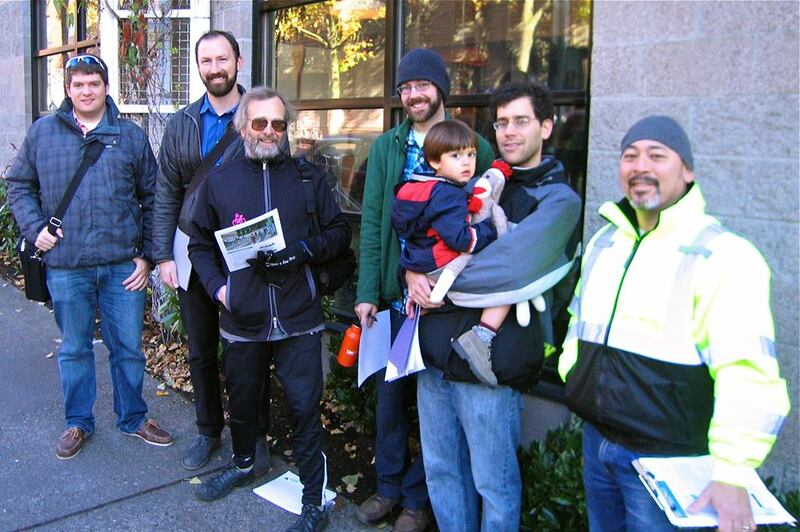 Here are some of the many groups and people who contributed to this safe street corridor. Ballard Greenways champion Selena Cariostis proposed a signalized crossing of Holman Road NW at 92nd NW to get to Whitman Middle School. 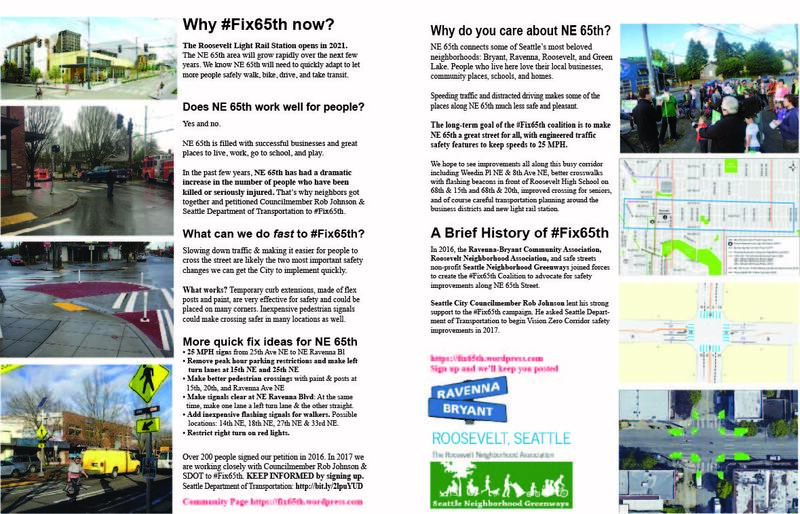 Her project was awarded more than $1 million in Move Seattle Levy funds and a signalized crossing will be built in 2018. Greenwood Phinney Greenways (GPGW) leader Justin Martin and Forrest Baum from NW Greenways set up scouting rides with Seattle Department of Transportation (SDOT) to find optimal east-west streets for people who walk and bike through the north Greenwood area to Greenwood Ave N. Their greenway recommendations will be part of the north end safe routes connections. Robin Randels, Teresa Damaske from GPGW joined up with Lee Bruch and Suzi Zook of Licton Haller Greenways to scout the best place to way to cross Aurora Ave N.
Led by Lee Bruch, these groups all teamed up with Jan Brucker at Aurora Licton Urban Village to get a traffic signal funded at 92nd and Aurora. Because Aurora is a state highway, these groups also sat down at multiple meetings with the Washington Department of Transportation. 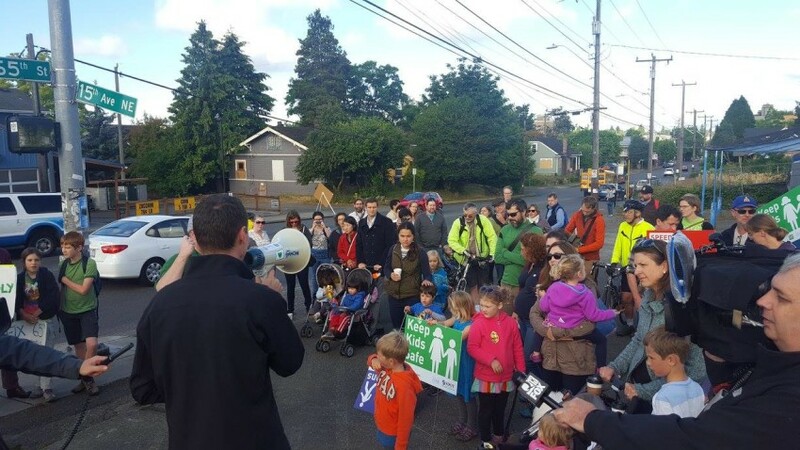 Getting Seattle Public Schools to support a walk-bike trail to Cascade and Eagle Staff Schools on 92nd was a multi-year effort of Cathy Tuttle from SNGreenways. 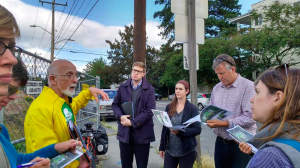 Brock Howell and Ian Strader from Maple Leaf Greenways and Janine Blaeloch, Monica Sweet, and Dai Toyama from Lake City Greenways helped to convince SDOT to join up the I-5 crossing to the new protected bike lanes stretching along N/NE 92nd. 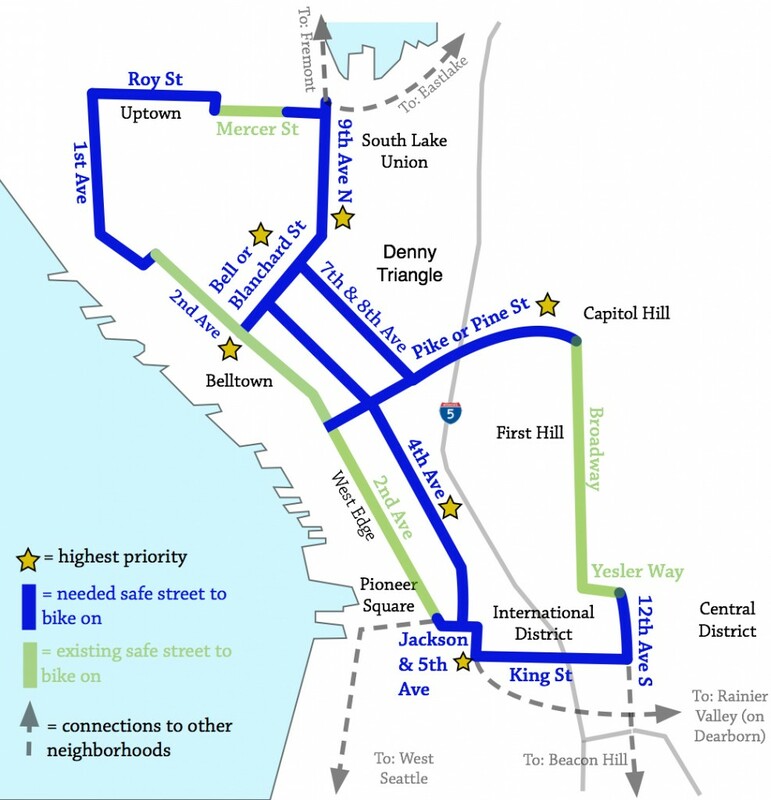 SDOT staff managed projects all along this corridor including Dongho Chang, Darby Watson, Mark Bandy, Brian Dougherty, Ashley Rhead, Serena Lehman, Dawn Schellenberg, and Dan Anderson. 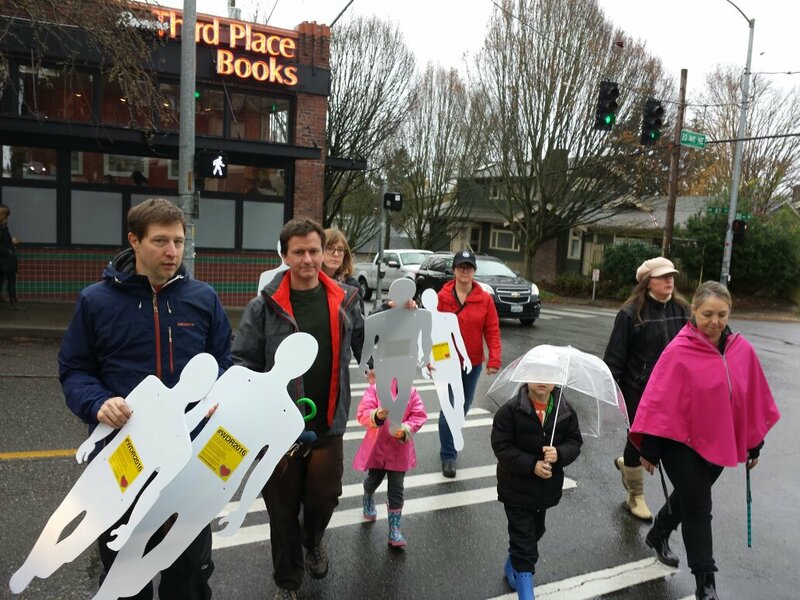 Eagle Staff and Cascade PTSA leader James Dailey is motivating the school community to walk & bike to school. 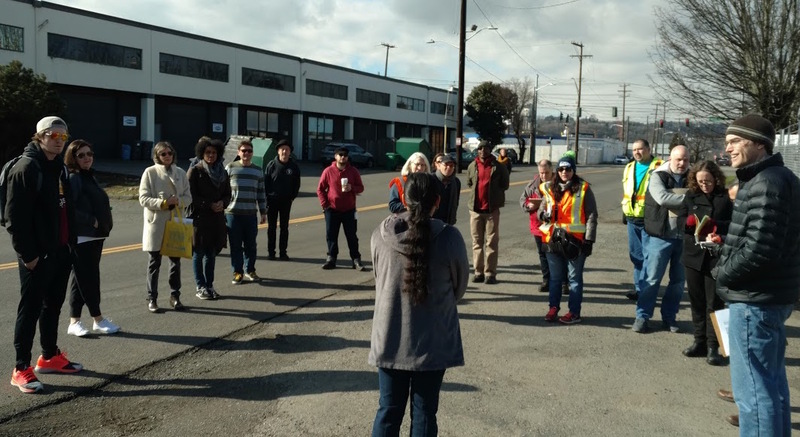 Seattle City Councilmembers Debra Juarez and Mike O’Brien attended several community policy walks. 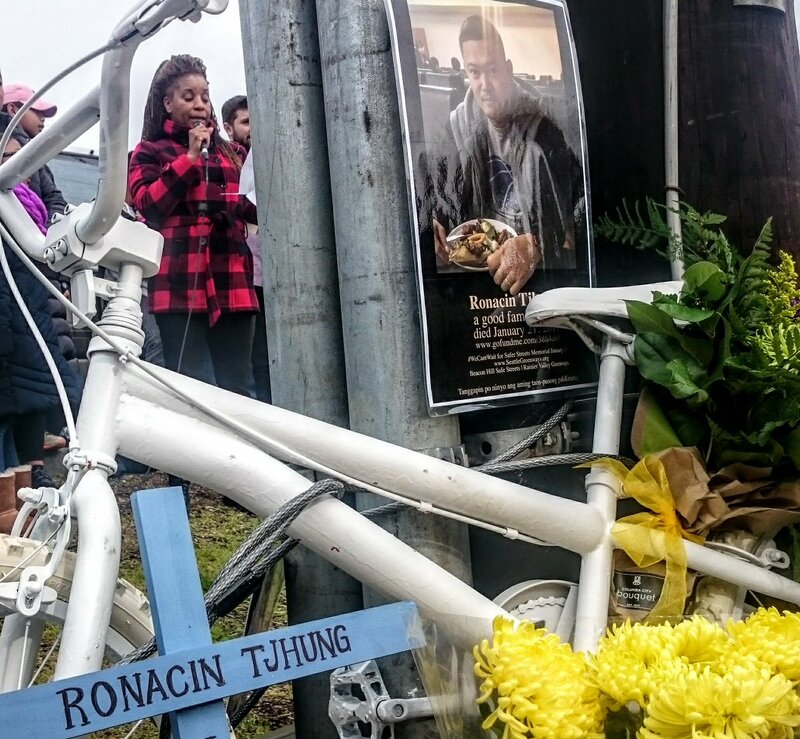 It really takes a village — or in this case multiple villages — to build safe, connected streets. 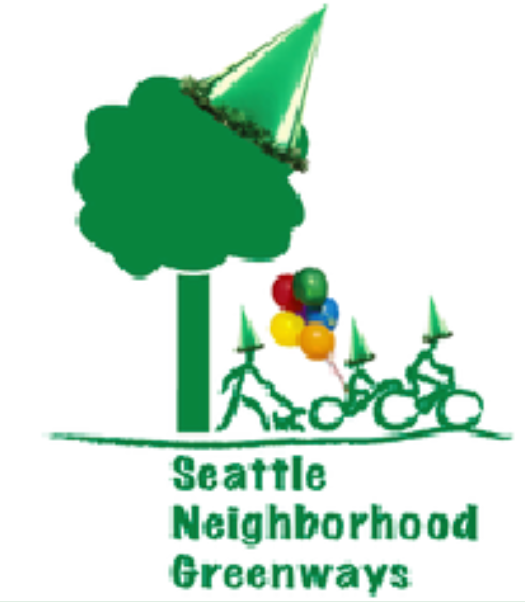 Join us in celebration August 27! We want to thank you at our annual volunteer appreciation gathering this Groundhog’s Day! Let’s celebrate all of the progress you helped make possible in 2016! New to volunteering with us? Come see what we’re all about. Bike parking is available in the basement of the Impact Hub. During First Thursday Art Walks in Pioneer Square, car parking is free from 5 pm to 10 pm at three parking garages listed below. To redeem, pick up a voucher at participating Pioneer Square stores, restaurants, or galleries. Seattle Department of Transportation (SDOT) has stepped out of their box, and into an intersection full of psychedelic circles. 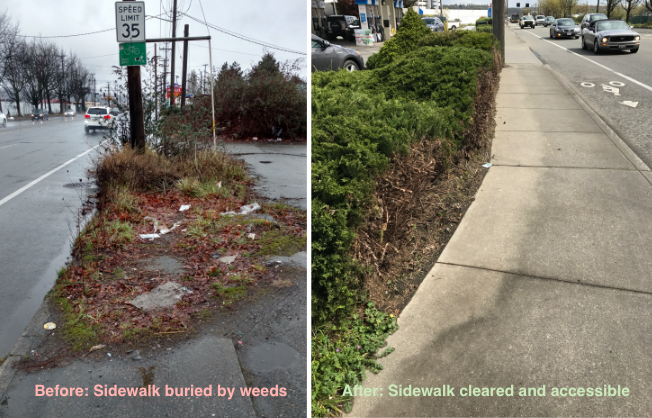 A recent article at The Urbanist highlights SDOT plans to construct an exciting new protected intersection at the Burke Gilman Trail crossing of 40th Ave NE. 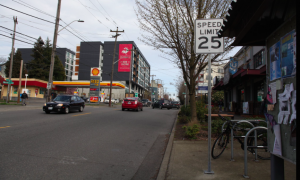 The safety design for 40th Ave NE is based on one of five Tactical Urbanism road safety improvements, funded and showcased by Seattle Neighborhood Greenways PARKing Day Plus Design Competition. NE Seattle Greenways volunteers Kenneth Trease, Jen Goldman, and Andres Salomon teamed up with Seattle Children’s Hospital Transportation staff Jamie Cheney and Drew Dresman to build and monitor this one-day project built of traffic cones and chalk. 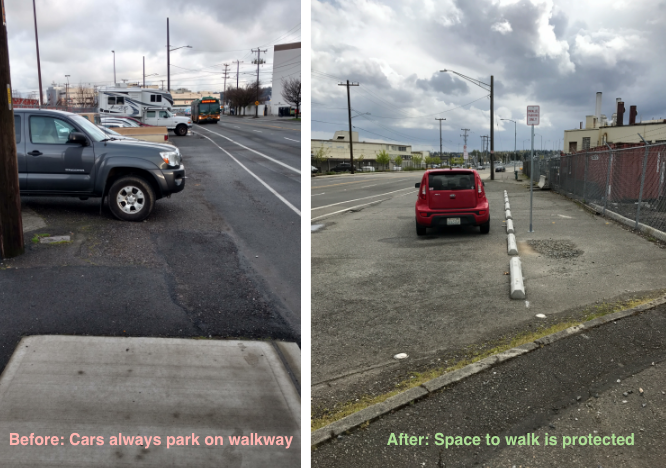 SDOT’s recreation of the PARKing Day Plus design is built of flex-posts and thermoplastic and will keep people safe at a highly problematic trail crossing. 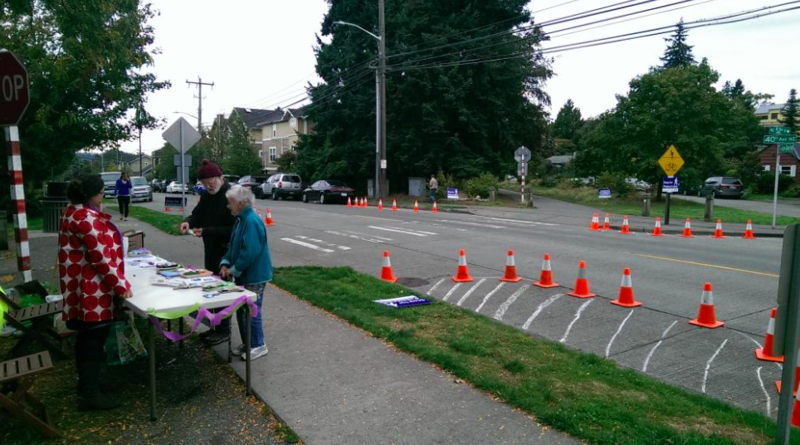 The use of just cones to simulate curb bulbs – and a few “stop for pedestrian” signs at the crossing and along the trail – had people approaching the crosswalk more cautiously in cars and on bikes. This crosswalk had been the site of a recent serious injury collision between a car driver and bicycle rider. Staff from Seattle Children’s Hospital joined as volunteers at the information table with NE Seattle Greenways members. Jen’s daughter Maggie who celebrated her 6th birthday at the intersection crossing with cupcakes, thought it was a splendid place for a party for a girl who likes to walk and bike! 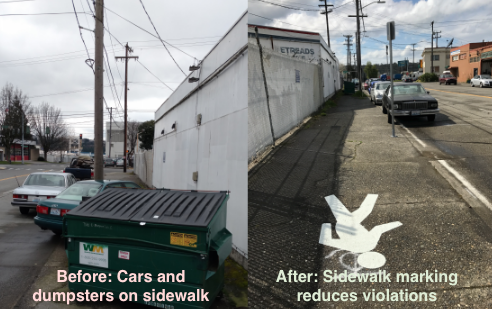 We couldn’t be happier to see a community-designed tactical urbanism project be transformed into a colorful permanent safety improvement!